iWebTemplate on Monday announced the release of iWeb Themes 4.0, a new collection of themes for use with iWeb, Apple's Web site building application. It costs $25, though individual themes are available for $10 each. The Garden theme can help you show off your green thumb to the world. 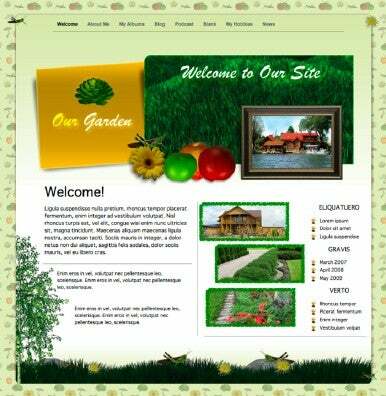 iWeb Themes 4.0 includes five new themes: Blossoms, Couple, Eyes Fire, Garden and Theater. Each theme includes ten templates rather than the eight customarily included with Apple's themes, including Hobbies and News, along with different page layouts to accommodate different types of information. Each template features different graphic elements which can be removed, moved, or changed in size, color and opacity. An installer is included to make sure the themes are put in the right location. System requirements call for Mac OS X 10.4.3 or later, iWeb 2.0 or 3.0 and 50MB hard disk space.